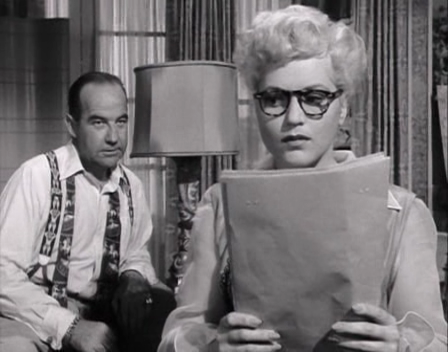 An abusive, controlling businessman (Broderick Crawford) hoping to impress a congressman (Larry Oliver) in D.C. hires a reporter (William Holden) to give private tutoring lessons to his not-too-bright fiancee (Judy Holliday), hoping she’ll learn how to act appropriately in a political climate. However, Holliday and Holden fall for each other, and soon Holliday realizes she wants no part of Crawford’s corrupt schemes. 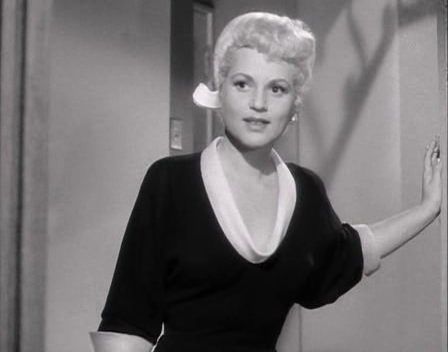 Peary is rather dismissive of George Cukor’s adaptation of Garson Kanin’s Broadway play, which gave Judy Holliday her break-through role both on stage and on-screen. He writes that “the scenes in which Holliday visits the historical monuments [in D.C.] and becomes excited by what America stands for are like bad Capra”, and he questions, “Why all the civics lessons? Does it take Thomas Jefferson’s words against tyranny to get Holliday to realize that Crawford hasn’t been treating her well?” He further argues that Cukor’s direction “is too theatrical (as is Holliday’s performance at times) and the script… is clever but has only a few bright moments”. 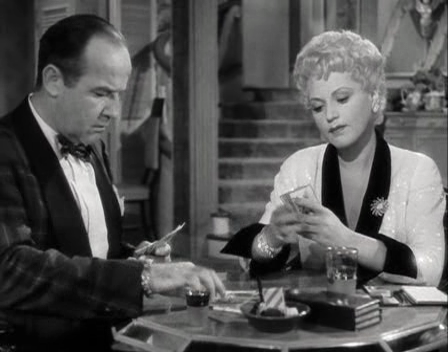 He states he doesn’t “like the way Kanin uses Crawford comically through much of the film yet, when it suits his purpose, makes him a real heavy.” He concludes his review by noting that the “best scene is the most famous — when Holliday beats Crawford at gin rummy”. I think Peary undersells this film. 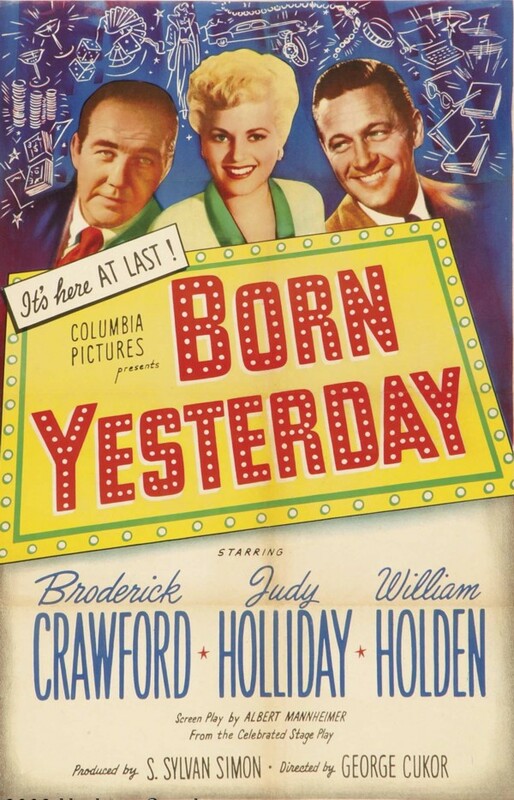 Sure, its theatrical roots are apparent, but Cukor nicely opens up the set, and Holden’s choice to provide civics-lesson field trips in D.C. doesn’t seem too far-fetched to me; gaining insights into your own challenges and blind-spots is sometimes easiest through “safe”, external topics. Holliday’s consciousness-raising comes across as both realistic and witty, and Kanin and Cukor’s decision to leaven Crawford’s sociopathic bully with humor is a smart one: sadly, he’s highly believable, and deserves to have plenty of fun poked at him while he gets his come-uppance. I like the fact that Cukor and Kanin are brave enough to show Crawford not only psychologically but physically abusing Holliday; her need to leave the relationship is ultimately about her own survival. Kudos should also be given for the relative maturity of the script, with Holliday openly propositioning Holden despite being engaged. Yes, as a most enjoyable classic. A no-brainer must – not only for the performances (esp. Holliday) but for the brilliant script & Cukor’s admirable direction. This ‘Pygmalion’ tale holds at its center the performance which caused one of the biggest surprise ‘upsets’ in Oscar history. Holliday was primarily up against Gloria Swanson (‘Sunset Boulevard’) and Bette Davis (‘All About Eve’) and beat out both. Who should have won is still debated today – but I think the votes got it right. It seems to me that a lot of people do not really realize just how hard comedy can be to perform. They seem to be under some illusion that having funny lines to say isn’t really acting. As far as that goes, they are partially right. But Holliday certainly isn’t just saying funny lines – her Billie Dawn is full of rich character, and it’s difficult to take your eyes off of her, if just to see what she’ll do next…and she’s always doing something interesting. Far from just saying lines (as many others would) – she is living, breathing, juggling and cascading them…as she gives us a powerhouse portrait of an unforgettable woman. I fully agree that Peary undersells the film and it’s somewhat mind-boggling that he, or anyone, could be “dismissive” of it. As well, why does he imply that it’s late in the film when Kanin “makes [Brock] a real heavy”? He’s a heavy from frame one! Best part of all: this movie is flat-out funny! I have seen it a good many times – and it always seems fresh somehow. I never find it boring (it never seems to lose its pace and it flies smooth) – in fact, when I see it again, I get swept up in it again. It’s beautifully crafted all-round and remains one of cinema history’s sturdiest comedies.